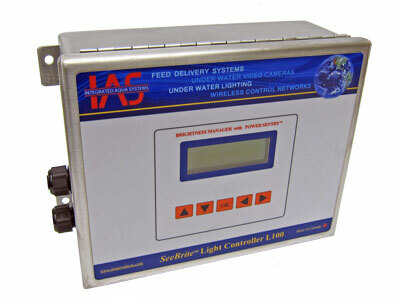 The SeeBrite™ Light Controller L100 is a compact light controller that manages the brightness and dimming of SeeBrite™ LED lights to avoid sudden changes in the light environment to minimize fish stress. The SeeBrite™ L100 controls the brightness and dimming of up to 6 SeeBrite™ LED light fixtures. Light brightness levels can be set from 1% to 100% brightness. When lights are turned on, the L100 manages the gradual increasing brightness of SeeBrite™ LED light fixtures to an operator pre-set brightness level. When lights are turned off, the L100 manages the gradual dimming of lights to 0% brightness at a pre-programmed rate. When connected to an uninterrupted power supply (UPS back-up), the L100 is fitted with Power Sentry™ circuitry that continuously monitors for power interruption. Upon detecting a loss of power, the L100 will automatically begin dimming lights to 0% brightness for all SeeBrite™ LED light fixtures connected to the light controller. When power is restored, the L100 will automatically begin a gradual ramp up to the operator’s pre-set brightness level. Each SeeBrite™ L100 Light Controller can simultaneously manage brightness levels for up to 6 SeeBrite™ LED light fixtures. Smooth surface keypad membrane control panel with no extruding control knobs allows for easy wipe down. Intuitive navigation interface makes for easy programming of brightness setting. 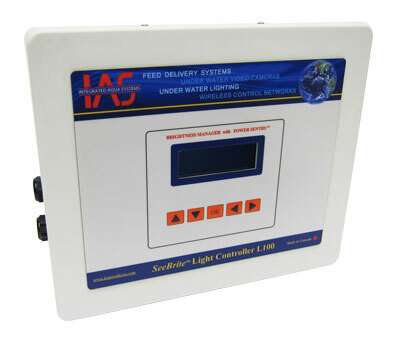 The SeeBrite™ Light Controller L100 is available in either a polycarbonate or an extreme environment stainless steel enclosure. Both enclosures are ideally suited for open sea pen or hatchery tank applications with IP 66 rating as protected from total dust ingress and protected against heavy seas or powerful jets of water.